Source: U.S. Energy Information Administration, from Bonneville Power Administration Note: Click to enlarge. Hydroelectric power plants located in the Columbia River Basin account for a little more than one third of all the hydroelectric capacity in the United States. The Columbia River runs from the Canadian Rockies and flows 1,214 miles through Idaho, Oregon, and Washington, but the river basin also includes parts of Montana, Nevada, Wyoming, and Utah. Hydroelectric power plants located on the river and its tributaries account for 29 gigawatts (GW) of hydroelectric generating capacity and contributed 44% of the total hydroelectric generation in the nation in 2012. The steep gradients of the Columbia River and its tributaries make it ideal for the production of hydroelectric power. The size of these facilities can vary significantly. With a net summer capacity of 6.8 GW, the Grand Coulee Dam, located in Grant County, Washington, is the largest hydroelectric power plant in the United States and the sixth-largest in the world. Other large hydroelectric plants in the basin include the Chief Joseph and John Day plants, both of which are larger than 2 GW. However, the basin also includes many smaller facilities under 100 megawatts (MW). 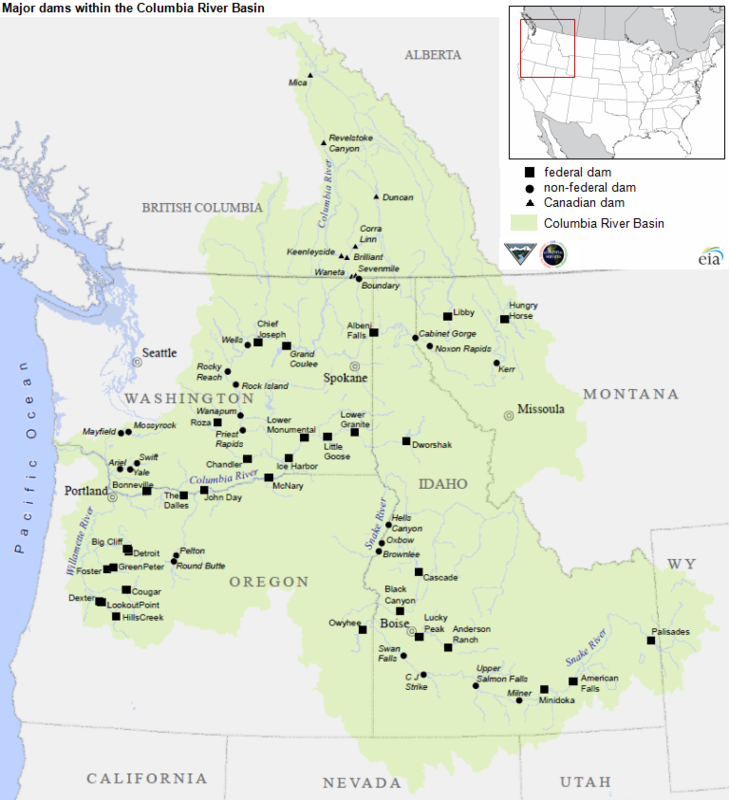 The Columbia River Basin includes both public and privately owned facilities. Nearly 70% of the capacity of the facilities in the basin are owned and operated by the federal government through the U.S. Army Corps of Engineers and U.S. Department of Interior’s Bureau of Reclamation. The electricity generated at these units is transported and marketed by the federal Bonneville Power Administration (BPA). Another 19% of the basin’s hydroelectric capacity is owned and operated by municipally owned utilities, including the 1,040-MW Boundary plant owned by the city of Seattle. The remaining 12% of the basin’s capacity is owned by private firms. A significant amount of hydroelectric power generated in the Northwest is consumed by California customers. In the late 1960s, BPA constructed two 500-kilovolt transmission lines capable of carrying power from the Pacific Northwest to the Los Angeles area. 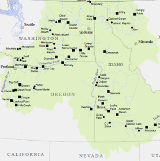 The Pacific Northwest-Southwest intertie was completed in 1971, giving Los Angeles consumers access to hydroelectric power originating from the Pacific Northwest. The Canadian province of Brtish Columbia, where the Columbia River forms, is also a major producer of hydroelectricity, which accounted for 92% of all electricity generated in the province in 2012. BC Hydro and Power Authority, a provincial crown corporation (similar to a state-owned utility), operates 31 hydroelectric power facilities, three of which lie along the Columbia River. Of the three dams, only one is designed to produce electric power while the other two were designed to provide water storage for downstream U.S. hydroelectric power production. The Columbia River Treaty (CRT), ratified in 1964 after 20 years of negotiations between the United States and Canada, led to the construction of the three storage dams in British Columbia. These storage dams capture the spring snow runoff for release later in the year, thereby lessening the seasonal fluctuations from waterflow. The treaty effectively doubled the water storage capability on the Columbia River. The CRT is currently being renegotiated; either party can terminate the treaty as early as 2024 provided they give 10 years’ advanced notification. Neither party has signaled any intent to end the treaty, but both have raised financial, energy, and environmental concerns that will warrant discussion as part of any treaty modernization. This is the must-read of the day in my book. Whatever our energy policies are to become, we need to be darn sure that power supplies will be there when people need them most. We live in an era of technological innovation. 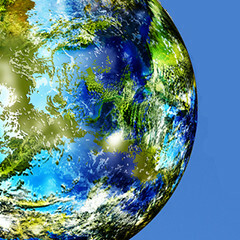 The impact of technology can be seen in virtually every field and industry across the spectrum. 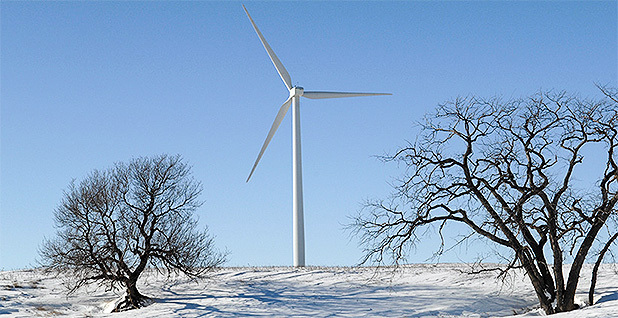 Located on the Oregon-Washington border at the terminus of the Pacific AC and DC intertie transmission lines, GridAmerica Holdings' proposed Goldendale project would help store and export the Northwest region's increasing wind power capacity to..